What’s the new campaigning look like? The first MobLab Live conversation of 2018 brought together global campaigners to talk about trends, how they’re adapting and what innovations they’re using to recruit and engage supporters. In February, MobLab shared a briefing on campaigning trends around the globe: Keep Campaigning Fresh: Trends Impacting Change in 2018. The brief was the product of talking with peers and colleagues working on some of the world’s most innovative and powerful social change campaigns. The latest MobLab Live used Keep Campaigning Fresh as a jumping off point. The hour-long conversation focused on ways campaigners are adapting to trends and using new campaigning strategies and tools to expand the audience and increase impact. We were joined on 20 March by Thaís Marques (PowerLabs), Tamseel Hussain (People Like Us Create) and Charlotte Goodman (Arizona Capital Representation Project and TinderBot co-creator). We hoped to have Feryel Charfeddine join us from Tunisia but internet blocking kept her off the call (a real-time example of the obstacles campaigners increasingly face). They shared how they’re sorting through trends and testing innovative campaigns. Activists and campaigners joined the live conversation and offered questions. Facebook Live is used to shift people from being passive audience members to active supporters and leaders. Thaís spoke about sharing polarising content and dramatic actions to get people talking and thinking. Movimiento Cosecha used Facebook Live to showcase undocumented immigrants as leaders and agents of change. WhatsApp use for community mobilisation is picking up in the global north and south. Movimiento Cosecha created WhatsApp organising circles for individuals and groups to communicate with one another; along with specialised functional groups like social media amplification groups (with hundreds people in it) to make the content go viral during public action days. Let Me Breathe in India uses WhatsApp groups as newsrooms where young mobile journalists share mobile stories that are then aggregated and released to larger audiences. Recent changes to the Facebook algorithm are leading campaigners to move away from broadcast messaging and focus more on Facebook groups and personalised communications. Guests talked about using Facebook groups to share articles and videos. Instagram and Snapchat are becoming popular and seem to have huge potential to organise young young people both in global north and south. Campaigners are increasingly using geo-filters and visual stories. Google has announced to launch the new AMP story format, a visually rich content format designed to generate more engagement from users. More campaigns are testing bots, particularly to help scale engagement during political and advocacy campaigns. Tinder Bot was created to use non-traditional campaign methods. It also helped people break out of their typical social bubbles and talk politics with people they weren’t usually connected to. Online tools and platforms can be used in innovative ways to get people to join and engage with campaigns. But it’s important to move people to offline actions, especially actions that provide opportunities for leadership. Movimiento Cosecha and TinderBot both benefited from plugging people into offline leadership roles and building organizational capacity to grow the movement. Mobile innovations done right can bridge the polarized divide? Mobile journalism, Facebook Live, WhatsApp groups and Tinder Bots are all examples of how mobile phones have become the go-to device for many campaigners. Tapping the social capital of our communities helps us engage in faster and more meaningful ways. Mobile also provides more people with a direct voice. More on the ground data and stories will actually fight fake news by verifying facts. Other mobile tools are identifying and matching people based on shared interests, perhaps helping break down the “filter bubbles” of the Facebook and Twitter newsfeeds. 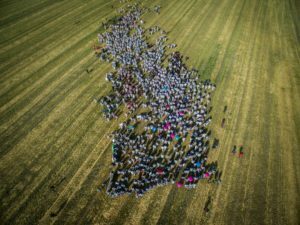 Automation and bots are helping campaigners on the front lines of health, humanitarian, political and social justice campaigns around the world. At present, campaigners and activists are adapting a hybrid approach that pulls in both automated bots and human interaction. Most people don’t want to talk to a bot. But, as Charlotte Goodman points out, it’s increasingly possible to imagine a future of campaigning in which people are comfortable interacting with bots and automated conversations. 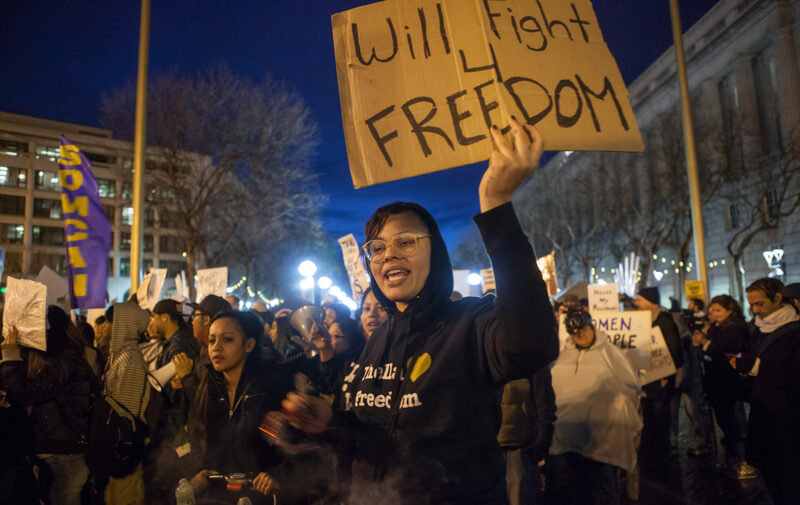 Featured image: Protesters against President Donald Trump begin a nighttime march from United Nations Plaza in San Francisco, one holding a sign reading “Will Fight 4 Freedom”. Photo by Pax Ahimsa Gethen. CC BY-SA 4.0 via Wikimedia Commons.